Mercy Housing Northwest is a nonprofit affordable housing developer operating throughout Washington. Bill Rumpf recently presented in a work session for the Senate Housing Stability and Affordability Committee on the impediments to building affordable housing. As a nonprofit housing developer, I'm often asked how we can speed up the timeline or lower the cost of creating much-needed affordable homes. The reality is it can be difficult when operating under tight restraints. Local policies are a key factor in this, and HB 1923/Fitzgibbon represents an opportunity to spur more affordable housing by removing some of the key impediments and increasing local government planning capacity. Parking Requirements: We've seen zoning that required up to 1.8 parking spaces per apartment, allocating land and construction budget to house cars, rather than build more affordable homes. Impact Fees: Water and sewer districts often represent a big burden. In rehabbing a senior complex where we put in substantial energy and water-saving improvements, the local jurisdiction set water/sewer fees for 35 compact apartments that typically have just one resident each, at the same level as if we had constructed 35 single-family homes. Our utility costs per unit at that site are among our highest in the state. Bellingham halved the parking requirement on a new development located near the county transit center and waived roughly 80% of the impact fees. This innovation was emulated by Skagit County, which has allocated state-authorized funding to pay for impact and utility hook-up fees on behalf of eligible housing projects. This can save several hundred thousand dollars on a larger development. In Tacoma and Seattle, public agencies have made land available for affordable housing near high-frequency transit. Combined with zoning to increase density in those locations, it has resulted in very efficient use of land. HB 1923/Fitzgibbon is a creative approach. It encourages local jurisdictions to take action to increase density and reduce regulatory barriers like those above. It provides a menu of options so that cities and towns can determine the approach that is the best fit for their local circumstances. Cities that opt to take advantage of these policies will be eligible for a $100,000 planning grant, funded by a $2.50 increase in the document recording fee. After five years, this funding will be used to pay for Operations and Maintenance of Permanent Supportive Housing for people earning up to 60% of the AMI. I am excited to say that HB 1923 passed on the Senate floor on Saturday, 4/13, and will return to the House for concurrence before heading to the Governor’s desk. Assuming the bill receives a favorable final vote, we will need to let our local officials know the impact that the policies in this bill can have for low-income households. As always, thank you everyone for your advocacy! Tara Nelson manages eight rental properties in northwest Washington, using the income to provide in-home support for an elderly parent. Tara supports HB1453/SB5600, which will reform the eviction process to increase the amount of time a tenant has to pay the rent. Last year, I rented to a 20-year acquaintance of mine in Mount Vernon, “Matt,” a single dad with two young kids. He was managing a restaurant at the time and had a decent income. But when the restaurant closed, the owners gave him very little notice. He fell late on his rent. My property manager wanted to immediately serve him with a three-day pay or vacate notice. I felt that three days was far too little to give someone to pick themselves back up. He could have ended up homeless, living with his small kids in a vehicle. Matt has no family in the area. His one remaining relative lives in New Hampshire. Matt went to a local agency for help, but he was ineligible for assistance. They would provide one month’s rent to a person facing eviction - but only up to $500. And determining eligibility takes much longer than three days. So I told my property manager to hold off. The next month, Matt found a job as a kitchen manager at another restaurant. He’s back to making regular payments and arranged with my property manager to pay additional installments for the amount past due. Three days is not enough time to turn your life around after a crisis like losing your job. Evictions for nonpayment of rent are a leading cause of homelessness in Washington State. The Seattle Times recently covered the story of a Seattle tenant who is facing eviction over $2. Being homeless is incredibly destabilizing and shifts a person’s focus away from finding a job to finding housing. Landlords are private property owners, but we are doing business in a social arena. There are ethical guidelines we should adhere to. It’s the same reason one can’t open a store and only sell products to white people. As a lifelong renter myself, it’s important to me to be fair and equitable in the way we treat our tenants. While it is an important source of income for my family (without it my dad would be in a nursing home), it’s also other peoples’ lives that I am dealing in. Luckily, a pair of bills in Olympia will give tenants a longer period to pay back rent, while still preserving landlord rights. House Bill 1453 and Senate Bill 5600 will reform the evictions process statewide, extending tenants’ notice to 14 days. A fair process for both parties – landlords and tenants – helps keep people stable and working, and keeps families together. Christine Long, Housing and Essential Needs Program Manager (HEN) for King County. 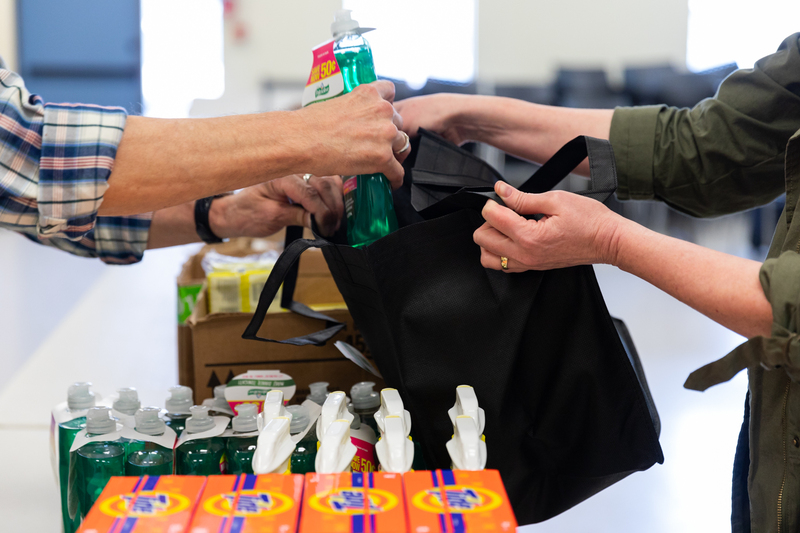 The HEN program provides rental assistance, hygiene supplies, and transportation assistance to disabled adults statewide. For the past 7 years, Washington state has been fortunate enough to have the Housing and Essential Needs program (HEN) as a practical, effective housing assistance platform for those with no income; who are disabled and unable to work. In King County alone, HEN has served over 10,000 single adults with temporary disabilities. However, these resources were not available to over 20,000 of the most vulnerable members in our community - those with long term mental and physical disabilities - until six months ago. The passing of House Bill 2667 in March 2018, with significant bipartisan support, allowed us to serve those transitioning from short to long –term disability programs. It prevented them from losing their housing at a time of great vulnerability and, due to an emergency clause, allowed HEN shops around the state to start enrolling those in need right away. However, in a supplemental budget year, a funding increase wasn’t on the table. Slowly, HEN programs filled all their enrollment slots and closed their doors, highlighting the dramatic unmet need for housing. As the July fiscal year started without new funds, our King County HEN program was forced to do something it has never done before and ceased new enrollments on July 9. On that day, the front lobby opened at 7:30am as usual, the case workers arrived and turned on their computers, we all caught up on emails from the night before, and grabbed one more cup of coffee before the phone lines opened at 9am. Then, for the first time in the history of King County HEN, we spent seven hours telling over 130 disabled adults, with no rental safety nets or alternative aide, that we could not enroll them in the program. “Due to limited funding, we cannot accept any new clients at this time.” The calls waiting to be answered rose to a constant high of 45 and no one could get a call in or out of the building for over four-and-a-half hours. Between the eight people on phones and the 130 plus callers, we dealt with shock, confusion, tears, frustration, and fear. One man I spoke with insisted that I was joking or how could he have invested so much effort in the process of getting enrolled only to be turned away from a service he was eligible for? Another called in sobbing because she was living outside with her young daughter and feared for their safety. Now, as we near the end of August, we have over 500 people eligible for HEN, on our list, waiting for services. As they wait, evictions are happening and homelessness continues. The Legislature will have an opportunity to address this gap in funding for HEN when the next budget session opens in January 2019; however, there is no time to wait. The HEN program has demonstrated its ability time and time again as an effective intervention tool and cornerstone in our communities statewide. The program is ready and available to help as soon as funding hits our doors. I urge you to call the state’s toll free Legislative hotline at 1-800-562-6000 and tell the Governor that this is an emergency and funding is required to help those in need now. 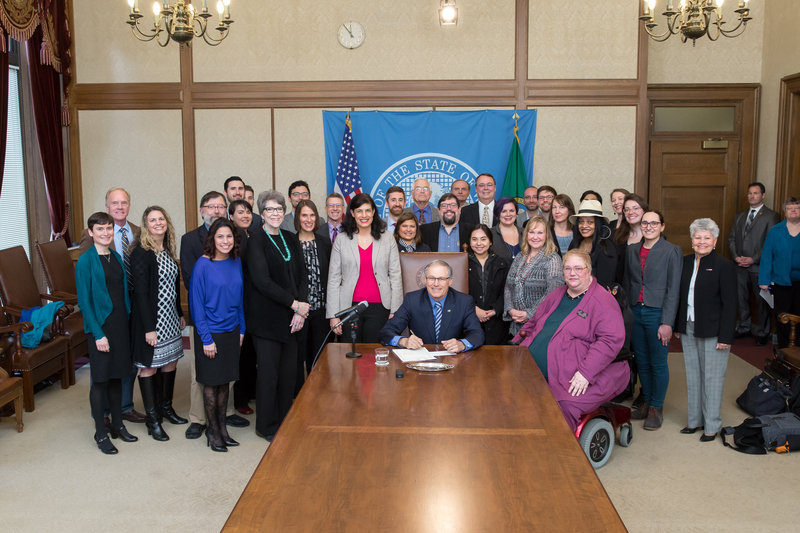 In this time of rising homelessness and sky-high housing costs across Washington, the state legislature has demonstrated extraordinary leadership and bipartisan support for solutions to the housing affordability and homelessness crisis across our state. On March 8, our state legislature ended the 2018 legislative session having made unprecedented and significant progress on solutions to the housing affordability and homelessness crisis in our state. and remove barriers to finding and keeping a home. Many lawmakers played an important role in securing these victories. Can you take a quick moment to thank them now? The investment the legislature has made is a giant step closer to what’s needed to actually solve this problem. We know that housing affordability is a huge problem to tackle and it takes many solutions that all work together. The legislature signaled that they understand this and prioritized passing a package of bills that, when taken together, will have a real impact. One bill in particular passed after more than a decade of advocacy – a ban on source of income discrimination. When this bill goes into effect, landlords will no longer be allowed to refuse to rent to someone just because they use rental or income assistance to help pay the rent. This is a huge victory for thousands of people across Washington. Families of color, single moms with children, veterans, and people with disabilities are all disproportionately impacted by source of income discrimination. Passage of this bill will help level the playing field and make affordable housing more fair and equitable. 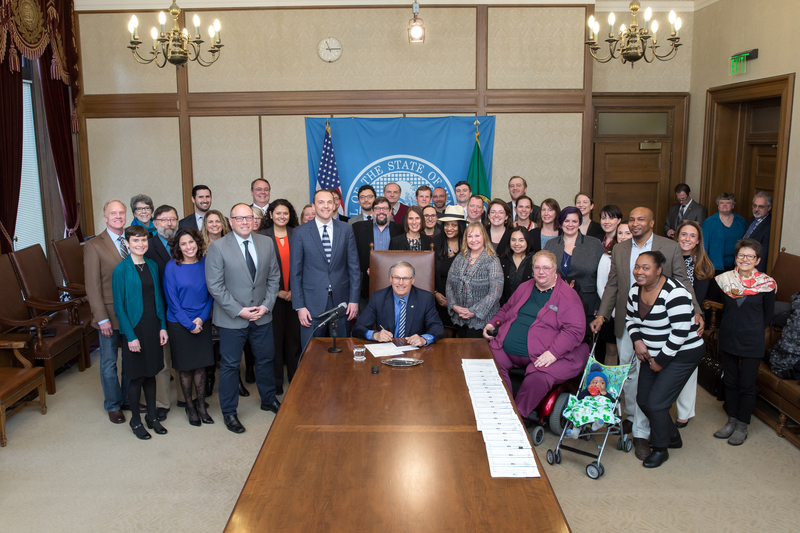 Governor Inslee signs HB 2578 into law. What is clear, is just how important it is to have housing champions in Olympia, fighting for these issues. We’re incredibly grateful for the work those leaders put in and for all the legislators who passed this common sense policy with strong bipartisan support. 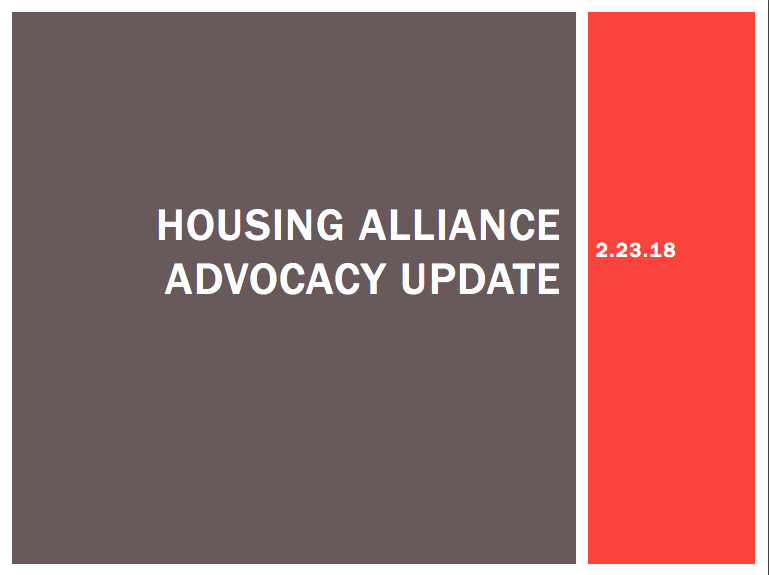 In addition to the Housing Alliance’s priorities, many good bills that we supported, lead by our partner organizations, also made it through the legislative process, such as bills on voting rights and youth homelessness. We’ll have more analysis on those bills, and a list of lawmakers to thank next week, stay tuned for more from us on that. $107 million in the Biennial Capital Budget for the Housing Trust Fund. The Housing Trust Fund builds and preserves affordable homes. It primarily serves people with the lowest incomes and those with special needs, including people with disabilities, families with children who are homeless, seniors, youth and young adults, and veterans. This investment will create approximately 3,500 affordable homes. House Bill 1570 helps an additional 11,500 people who are homeless or at risk of homelessness access housing assistance and services. This is funded by a $22 increase to a fee that is paid when real estate documents are filed, such as those signed to close on a new home purchase. This is the state’s primary source for funding homelessness services and is split between the state and counties so local communities can quickly address their most pressing needs. The increase will generate approximately $26 million each year to fight homelessness. Additionally, this bill removes the expiration date on the fee so that communities have a permanent and reliable source of funding to reduce homelessness. Finally, the bill fixes a problem created in 2014 which mandated 45% of all state dollars be used on rental assistance solely on the for-profit rental market. Now, state funded rental assistance can also be used in nonprofit housing geared toward serving people exiting homelessness who may have multiple barriers to securing for-profit housing. After more than a decade of advocacy, when this bill goes into effect, landlords will no longer be allowed to refuse to rent to someone just because they use rental or income assistance to help pay the rent. The bill also creates a mitigation fund to reimburse landlords for improvements necessary to rent to households with certain housing assistance, and provides landlords access to funds if there are damages beyond normal wear and tear. The mitigation fund includes important consumer protections for tenants, including prohibiting landlords from taking legal action against a tenant if they have received reimbursement from the mitigation fund. Before this bill’s passage, people with permanent disabilities and people whose primary disability is a substance use disorder were ineligible for Housing and Essential Needs (HEN) rental assistance. This causes people with disabilities to become homeless. This bill fixes that by allowing people with permanent disabilities to retain their housing assistance while they apply for federal disability benefits. People who are appealing a denial to SSI or SSDI must obtain a copy of their medical records in order to prove their disability status. Washington has the highest medical record copy fee in the country, which is prohibitive for people with low-incomes and creates a substantial barrier that prevents people from accessing federal disability benefits. This bill provides free access to those records once every two years, and will help more people access economic security. This bill allows people to keep a greater portion of their resources and still be eligible for public assistance (like the Housing and Essential Needs and Temporary Assistance for Needy Families programs). It will prevent people from having to sell a reliable car that lets them get to work or to the doctor, and lets them maintain a greater amount in savings to better weather a financial emergency. Affordable homes built with federal Low Income Housing Tax Credits go through a transfer of ownership when the for-profit investor exits the partnership, usually 15 years after the homes are built. No cash is involved in this ownership transfer, but without this clarification, nonprofit organizations could be taxed on this transfer at a significant amount. This bill requires the state to continue the current practice of not charging the Real Estate Excise Tax for an additional 17 years which allows nonprofit housing providers to keep those resources for providing affordable housing and services in their communities. In many Washington communities, the cost of land has a significant impact on the ability to create homes affordable to people with low incomes. This is especially true in high cost areas like the Puget Sound region. This bill makes it easier to transfer underutilized public property so it can be used for affordable homes. Thanks for being part of the movement for safe, healthy, affordable homes. Every other Friday during the legislative session, all affordable housing and homelessness advocates are invited to join us for a conference call and webinar to hear the latest updates from Olympia! Our policy team reports back on on the progress of our lead policy priorities, as well as bills from our partner organizations that we are supporting. Provide a space to ask questions and sharpen your advocacy skills. Click here to register for our final call on March 9. We're in the homestretch of the legislative session, and the Feb 23 call included some very detailed updates on the progress of our lead priorities (spoiler alert: all our bills are alive!) and an update on how you can advocate to get these bills over the finish line! This call did not get recorded as a webinar, but you can download the slides below. “DSHS recently gave me 24 days’ notice that I would no longer be eligible for HEN benefits because they determined my disability to be long-term rather than short-term. They plan to transfer me to ABD, so instead of housing support I will receive a $197 cash stipend. I have spoken before about the problem of securing housing when a client transfers from HEN to the Aged, Blind, or Disabled program (ABD). How a portion of those who move between the two programs will return to homelessness, triggering a renewed cycle of instability and emotional trauma. The additional time and effort needed to help these clients cope and move back into stable housing is incredibly frustrating when the cause is entirely preventable. Nicholas is one of those clients. Nicholas and I have talked several times over the past few weeks and I have listened to his story of how HEN helped him recover a measure of basic security. I have listened as he worried about how he would pay rent because he’s transferring to ABD. I have watched as he showed me his HEN termination letter and worried whether or not this bill would pass and if it would be soon enough to help him. He is transferring to a program for those too disabled to work, and while trading his housing assistance for modest $197 a month might not cause him to experience homelessness, after a year of working with him to help re-build his life, it is not a chance worth taking. We need a change. Our lawmakers have a chance to alter the rules of the system and provide help not harm. A change in law would offer housing assistance to HEN clients transferring to ABD and to ABD clients at risk of homelessness. HEN is ready to accept them. The Senate version of this bill that I testified on two weeks ago has died, but it’s companion, House Bill 2667, could become law if our legislature takes swift action – and you can help. Join me in asking our lawmakers to support this bill, not for any grand return but on behalf of those who feel alone and forgotten. Let these people know that you see them and you care. Today, housing advocates traveled to Olympia to testify in support of Rep. Macri’s bill HB 1570, the Washington Housing Opportunities Act. I was not able to be there today but I want to tell you why I support it. I am a licensed WA state real estate broker and Realtor in Thurston Co. who follows issues of homelessness and lack of affordable housing in our state. I support the changes to the Homeless Housing & Assistance Surcharge in the document recording fee proposed in 1570. As a citizen, I appreciate that 60% of those funds stay right in our county. County control allows support of local non-profits already enacting effective solutions to homelessness and housing access – the money is going to organizations I trust. Granting the county councils the ability to increase the fee up to an additional $50 means that counties have greater control to assess what amount feels appropriate for their constituency and the needs they face in their county. As a real estate broker, I see firsthand how those fees affect homebuyers…not at all. Most are happy to pay a modest fee to know that others can be helped with their housing needs when they have means to purchase a home in a very expensive state. Lack of affordable housing is a central driver to homelessness and the recording fee is one tool to equalize the impact of real estate activity to allow all our state’s residents the chance to live in a safe, healthy, affordable home. In the midst of thousands of dollars in closing costs to purchase a home, the recording fee is a drop in the bucket for most homebuyers. I urge the legislature to eliminate the sunset on this fee so that organizations can count on and plan to have the funds into the future as they build comprehensive plans to address our homelessness and housing crises. This recording is from February 9th and includes an update on housing bills that survived (or didn't survive) policy and fiscal committee cutoffs. Plus, something to celebrate! Every other Friday during the legislative session, all affordable housing and homelessness advocates are invited to join us for a conference call and webinar to hear the latest updates from Olympia! Our policy team will report back on on the progress of our lead policy priorities, as well as bills from our partner organizations that we are supporting. Click here to register for our upcoming calls on Feb 23, and March 9. Click here to register for our upcoming calls on Feb 9 and 23, and March 9. This recording is from January 28 and includes a recap of how the Capital Budget was passed, updates on our other lead priorities, and info on bills from partner organizations that we're supporting. We are thrilled that the state legislature came to agreement on, and passed a Capital Budget that includes $106.7 million for the Housing Trust Fund. There is no doubt that we’re facing a severe shortage of homes affordable to low-income households in communities all across Washington, and that the greatest impact of that shortage is increasing homelessness. The money invested in the Housing Trust Fund will address this by creating more than 3,000 affordable homes all across the state. That the legislature passed this before the end of the second week of the session, with only one no vote between the entire House and Senate, demonstrates leadership and a growing understanding of the importance of investing in affordable homes. We appreciate the commitment of legislators to getting this passed and are especially grateful for the hard work of Senator Sharon Nelson, Senator David Frockt, Senator Mark Mullet, Speaker Frank Chopp, and Representative Steve Tharinger. But the work is not done. To get built, many of those homes need federal Low Income Housing Tax Credits. Since the deadline to apply for those credits was only missed by one day, and the many projects waiting on the Housing Trust Fund were unable to apply, the state Department of Commerce and the Washington State Housing Finance Commission must work together to find a way to ensure those projects can still access the final funds they need. Otherwise, we could still lose an opportunity to leverage $178 million in federal funds to provide homes for homeless veterans, homeless families, people with chronic mental illness, and many others who face the greatest barriers to securing a home. We’re counting on these agencies to quickly develop a solution that ensures we don’t leave behind people in our communities who are struggling the most.